PHILADELPHIA (WPVI) -- Millville's Mike Trout turned 26 Monday and not only did he receive a gift from his teammates, he got one for himself. For his birthday, his team gave him a bath, kind of. In video posted to Trout's Twitter account, his teammates doused Trout with some eggs, baby powder, an Icee, coffee creamer, cereal and whatever else they could find. Then later during a game Monday night against the Baltimore Orioles, Trout got his 1,000th career hit.
.@miketrout celebrates his birthday with his 1,000th career hit! He is the 11th player to reach 1,000 hits with the Angels. Earlier in the day, Philadelphia Eagles quarterback Carson Wentz tweeted "happy birthday 'ol buddy" to Trout. Wentz had handed Trout a football at Lincoln Financial Field last January. The Eagles said that was his birthday present. 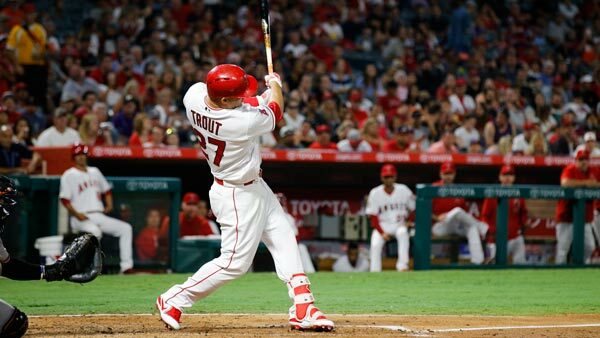 Mike Trout may be from Millville, New Jersey, but he's grown accustom to the warm weather of California as a star on the Los Angeles Angles of Anaheim.